Is Lottoland A Scam? How Does Lottoland Work? Answers Here! 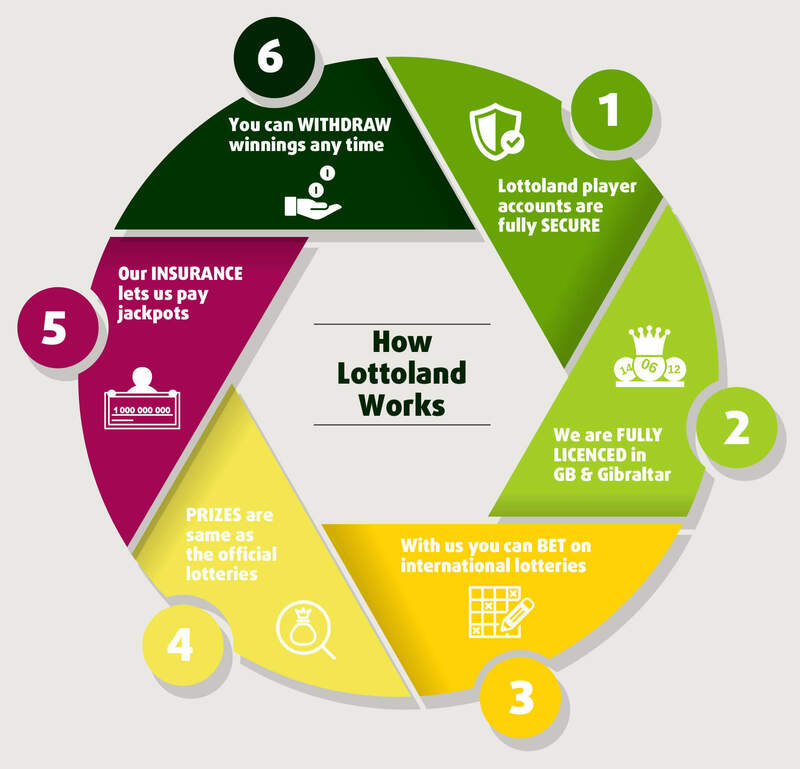 With so many new lotto lovers across the UK registering as new Lottolanders we thought it was high time to clearly spell out exactly how Lottoland works, especially our prices and prizes and what to expect if you win with us. We are going to address some of the most common questions that we get asked here at Lottoland. Hopefully these answers will help you to understand a little bit more about how our company works, and ease any concerns you may have. Q. IS LOTTOLAND A SCAM? No Lottoland is not a scam! Lottoland holds a United Kingdom gambling license and is subject to the same rules and regulations as any major UK gambling company. Any money which you win at Lottoland is guaranteed to be paid out in full to verified accounts.Our license is fully reliant on our ability to pay out our customers’ winnings, swiftly and reliably, while remaining fully transparent with regards to our operations and financials. We must maintain the highest of standards in order to be able to keep our licence, and that includes paying out on any jackpot wins, no matter how big they are. The most important thing to remember with Lottoland is that you are not buying official lottery tickets and Lottoland is not affiliated with the official lottery providers in any way. Rather, you are placing a “lotto bet” on the outcome of the lottery draw. For Lottoland bettors this closely replicates buying an official paper ticket but there are a few important distinctions and common questions which we will address below. Q. HOW DOES LOTTOLAND WORK? 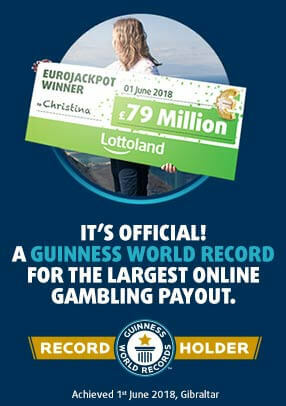 Lottoland offers people in Britain the chance to bet on a wide range of international lotteries. At Lottoland you bet on the outcome of the official draw, based on exactly the same prizes as the official lottery. Lottoland is able to pay out any wins, large or small, and the proceeds can then be withdrawn by you whenever you wish. For smaller prize tier payments we make the payment directly from the fund we have from the total sales for the draw. For us to make the larger prize tier payments we take out insurance policies to cover the eventuality of a Jackpot win or a substantial payout on your Lotto bet. Part of the Lotto bet price you pay goes towards the payment of this insurance policy. This means that we can pay out no matter how big the lottery jackpot win. Q. HOW CAN LOTTOLAND PAY OUT JACKPOTS WORTH OVER £1 BILLION? The majority of prizes at Lottoland are paid out of our profits as a normal part of business operations. However, when jackpots begin growing into hundreds of millions of euros we employ major insurance companies to pay out such a large amount of money if a Lottolander wins. For example, we were able to pay out £79 million to our lucky Lottoland winner Christina when she won by betting on EuroJackpot. Of course, as everyone knows, the more the risk the higher the premium, so once jackpots start to hit the half a billion mark there comes a point where our ticket prices rise, to cover these premiums. (Though such instances are rare). Being licensed in the UK means that we have to abide by a number of strictly controlled rules, including those which relate to the security of everyone who uses Lottoland. All personal data - including payment details - will be processed to the highest safety standards at Lottoland. Lottoland.com itself gets only the last four digits of your card number to see, while the full details are stored by our payment service provider Adyen. Adyen must undergo stringent tests by Visa and MasterCard to be certified in accordance with PCI DSS and so to be able to handle the payments annually. Lottoland itself is regulated by the Gibraltar Gambling Commission and also United Kingdom Gambling Commission and is licensed by the Irish National Excise Licence Office. There is very strict scrutiny to ensure the safe processing of customer and payment data as part of our licensing conditions. Q. DOES LOTTOLAND DONATE MONEY TO CHARITY? Lottoland is a private company and as such we do not donate the majority of our profits to charity like an official lottery would do. However, we do sometimes partner with charitable organisations and make donations to various causes. One example of this is our 2018 partnership with the Irish Red Cross. Q. CAN I LEGALLY ENTER POWERBALL, MEGA MILLIONS, EUROJACKPOT ETC. FROM THE UK WITH LOTTOLAND? You can bet on any of these lotteries legally at Lottoland because you are not 'playing the lottery' but rather betting on the results. In order to buy an official lotto ticket you must be present in the country where it's run. In many cases, such as the US lotteries, you must also be an official resident in order to collect winnings. Betting on the results with Lottoland provides an alternative way for UK Lottolanders to participate and means you can win the same amount as the official jackpots. One of our main objectives at Lottoland is to provide our customers with international lottery options without having to buy an airplane ticket! For example, the Irish Lotto has long been popular outside of Ireland. UK lotto fans have been enjoying it for years, but until now have never been able to enjoy all the features of the Irish Lotto. Now that has changed and the Irish Lotto has become one of the most popular lotteries at Lottoland in the UK. Plus we also have EuroJackpot, the other big European lottery, which is still relatively unknown here but every bit as famous in Germany and Scandanavia. We also offer the massive Spanish Christmas Lottery, better known as "El Gordo" plus the the two American giants MegaMillions and jackpot world-record holder, PowerBall. And really, we haven't even scratched the surface here. There's a huge choice of lotteries here, some with very low jackpot odds, others with tougher odds but massive jackpots, and everything in between. Check out all our lotteries to see just how many we really have. Q. WHY DID THE PRICE OF LOTTOLAND POWERBALL TICKETS KEEP GOING UP? Sometimes big lotteries like Powerball have jackpots which rise into hundreds of millions of euros. This is covered by our insurance company, but the insurance premiums rise when jackpots get this high. In circumstances where our insurance premiums are going up, in order to remain profitable Lottoland must also raise its prices accordingly or stop selling tickets altogether so that we are not operating at a loss. In extreme cases, like the £1 Billion Powerball jackpot, options such as the Double Jackpot may be disabled as the cost of a ticket would be astronomical. However apart from the very rare circumstances when there are extraordinarily large jackpots prices will remain at the base level. Q. HOW ARE PRIZES AT LOTTOLAND PAID OUT? WHAT IF I WIN THE LOTTERY AT LOTTOLAND BUT NO ONE WINS THE OFFICIAL LOTTERY? You have the winning numbers and no one wins the official jackpot: You would win as if you were the only winner and take the £100 million pot for yourself. The official lottery would continue to rollover. You have the winning numbers and 1 person wins the official jackpot: You would win as if you were the 2nd winner of the official lottery and therefore win a 50% share of the jackpot or £50 million. You have the winning numbers and 2 people win the official jackpot: You would win as if you were the third winner of the official lottery and take a 1/3rd share of the official pot or approximately £33.33 million. You have the winning numbers along with one other Lottolander, and 2 people win the official jackpot: You would win as if you were the fourth winner of the official lottery and take a 1/4 share of the official pot or £25 million. Q. DO I PAY US TAXES IF I WIN AN AMERICAN LOTTERY? At Lottoland you win the same amount of money as you would if you bought an official lottery ticket. For American lotteries like Mega Millions and Powerball this means that you get your winnings paid out as an annuity over 30 years and less the 38% you would pay in state and federal taxes (as state taxes on gambling vary from state to state this is an average). So while you do not pay any taxes, the winning amount you receive will be the same amount as a US-based winner would receive after tax was deducted from their winnings. Q. DO I PAY TAXES ON MY WINNINGS IN THE UK? You do not pay any taxes on your winnings in the UK because winnings from gambling are not taxable. For most European lotteries like EuroJackpot you will be paid the full amount as a lump sum as most European countries don’t tax gambling winnings. The main exception to this European rule is the Spanish Xmas Lottery and El Gordo Primativa where your winnings would be less 20% as gambling winnings are taxed in Spain, and you will receive the same amount that a Spanish winner would get after tax.